I was already getting sick of bread on day 1 of the 30 Day Bread Challenge as I forced myself to finish yesterday’s loaf before going to sleep last night. I don’t know why the low-carb’ers think this stuff is addictive. Maybe bread is super-tantalizing when it’s taboo. But when you have to eat a loaf everyday, you soon think of all the other foods you’d rather have. My 30 Day Bread Challenge is not a stunt, and it’s not going to prove anything. I’m going to continue to lose weight, because I’m exercising and eating my bread with lots of vegetables and whole foods. If anything, I’ll end up eating less calories because of the restrictive nature of having to eat a loaf of bread every day. It kind of takes your appetite away. 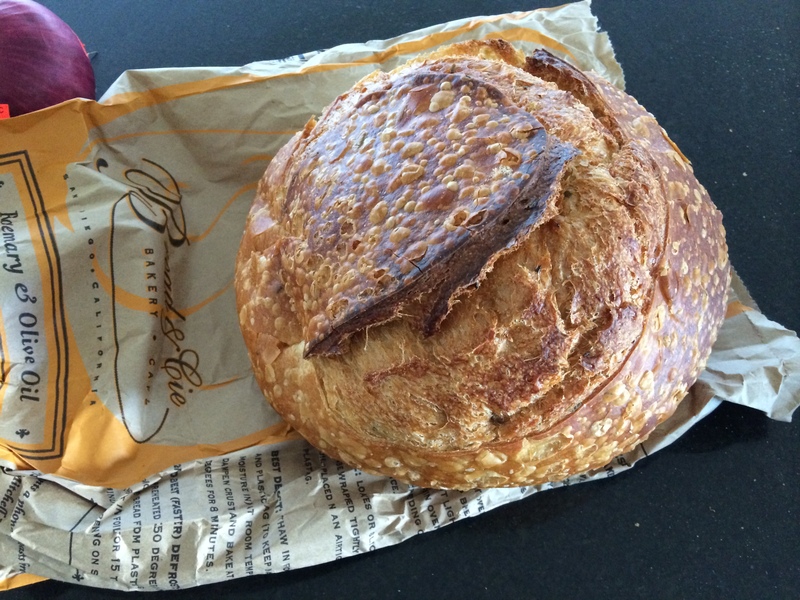 Today I bought a 450g Rosemary & Olive Oil boule from Bread & Cie. Yesterday, I thought I’d eat only whole-grain loaves. That’d be too boring for 30 days. Also, I thought I’d be eating veggie sandwiches the whole month. More likely it’s going to be eggs or meat with the bread.